Introducing The Khulisa Deep Dive Series: Dramatherapy… what’s that? Khulisa works in schools, prisons and in the community with ex-offenders. We run intervention programmes which help develop social and emotional skills in young people and adults, which we know lies at the heart of well being. Our programmes use a proven range of creative methods including restorative approaches, trauma-informed care and dramatherapy. In a series of blogs, Caroline Brindle, Khulisa’s Programme Manager in the North West and a qualified Dramatherapist, will look at how using dramatherapy helps our programme participants. Part 1: Dramatherapy… what’s that? Dramatherapy is a form of psychotherapy – an expansive term which covers all therapies that use psychological methods to treat emotional and mental health conditions. This ranges from one to one talking therapy, to group therapy, to Dance and Movement therapy. Dramatherapy is a creative psychotherapy as it can utilise all of the above – as well as elements of art work, play, stories, myths, puppetry, masks and improvisation within a safe, therapeutic space. 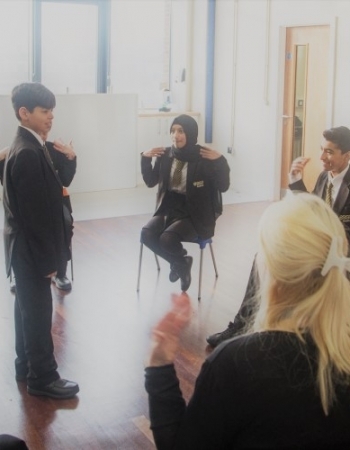 Dramatherapists work in a variety of settings – the NHS, residential homes, schools, prisons and social services. Their work is with adults, young people and children who might experience mental health challenges, physical/psychiatric/neurological conditions, learning difficulties, dementia, autism and more. The title “Dramatherapist” is a protected term by law – this means that to be a Dramatherapist the practitioner must qualify for an approved Master’s degree, and be registered with the HCPC – the statutory UK regulator for health, social work and psychological professions. They must abide by strict ethical and legal guidelines. Traditional ‘talking therapies’ can be difficult for some people – young children often don’t have the words to explain how they feel, for example. At Khulisa, we work with young people and adults who have frequently experienced trauma in their lives, and we now know that this can lead to the part of the brain responsible for verbal and cognitive skills to sometimes shut down. One to one talking therapy with clients who have experienced trauma is often ineffective, and in some cases can actually re-traumatise the person. Dramatherapy works with the whole person, body, mind and soul, and every dramatherapy session will be different to the next, as it is led by the client, not the therapist. Over the coming months, we will look at some of the core principles of dramatherapy, and explore how they contribute to our Khulisa programmes. Inside Time is a monthly newspaper for prisoners and prison staff, with over 60,000 copies distributed free of charge to all prisons in England and Wales. In this month's Khulisa Voice Column we share the story of James who we worked with on one of our most recent programmes.